Since 1995, Working Person's Store catalog has been on a singular mission: to deliver the very best in name-brand work apparel at the lowest coupon code backed prices, with a commitment to honesty and customer service. Working Person's Store is recognized as one of the country's fastest growing privately-held businesses with an award-winning website, WorkingPerson.com which serves thousands of customers on five continents every day. Today, specializing in brands that work, and backed by a 120% Price Protection Guarantee, Working Person's Store is the leading online retailer of quality name-brand work wear, work footwear and safety gear featuring top brands such as Carhartt, Wolverine, Dickies, Under Armour, Timberland, Dr. Martens, Carolina Shoe, Timberland PRO, Wrangler and over a hundred more. Work wear - You work hard, and so do they. Working Person's Store provides you with the widest range of top-quality, affordable work wear with plenty of rugged options for both men and women. Stock up on resilient work shirts and jackets, shorts, pants and jeans, chaps, overalls and coveralls, sweatshirts, underwear, headwear, suspenders and belts, compiled from all of the leading brands that mean business. Invest in protective body armor and flame-resistant clothing that will ensure your safety or outfit your entire staff with the Corporate Apparel collection, featuring shirts, sweatshirts, outerwear and headwear that will display your company logo with pride, which they do in house. Outerwear - Stay comfortable and dry no matter what weather conditions you're subjected to, with a premium range of outerwear that come outfitted with a 120% Price Protection Guarantee. You'll find durable Dickies and Carhartt coats, vests, Helly Hensen jackets, as well as heavy-duty insulated overalls, coveralls, rain gear and hoods that offer even more layers of outerwear protection against the elements. Footwear - Get suited up from head to steel toe with high quality men's and women's soft toe and safety toe work boots and shoes that are up to the task and ready to keep your feet protected during any job, working condition or application. Browse a tough line up of men's, women's and unisex footwear, from steel toe boots to sporty hiking and logger styles, insulated shoes to sandals, moccasins, military boots, and waterproof rubber boots that will keep feet warm and dry. 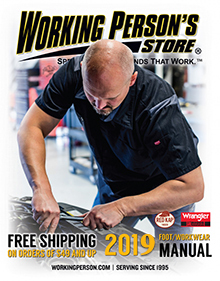 Shop Working Person�s Store�s selection of work boots and shoes by category, price or by manufacturer with all of the most popular brands and styles in stock. Accessories - Enjoy peak performance with the right work accessories that will give you the confidence and peace of mind that you need to make it through every shift. Protect yourself from injury with personal protective equipment, whether it's workplace-related or while tinkering away in your own garage with high-caliber safety glasses and gloves, knee pads and mats, flashlights, tactical knives, and more accessories that will serve you both on or off-duty. Browse bags and bandanas, sunglasses, cooling products, water bottles, flasks and more. For nearly a decade, Working Person's Store has served as one of the leading destinations for high-quality/low-priced name brand work apparel, footwear and safety gear, catering to an infinite number of satisfied customers that span five continents.